LOS ANGELES -- "Avengers: Infinity War" is still ruling the box office in its third weekend in theaters, easily beating out the mom-themed fare. 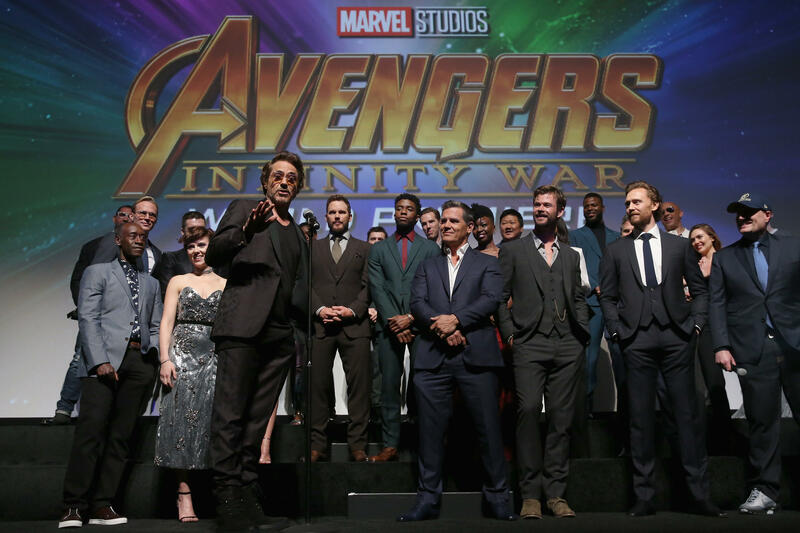 The Walt Disney Studios on Sunday estimates that "Infinity War" has added $61.8 million from North American theaters bringing its total domestic earnings to $547.8 million. Globally the film has now grossed over $1.6 billion -- $200 million of which was from its massive opening in China this weekend. It's now the fifth highest grossing film of all time worldwide. The superhero blockbuster overpowered newcomers like the Melissa McCarthy comedy "Life of the Party" and the Gabrielle Union thriller "Breaking In," both of which were strategically timed to debut on Mother's Day weekend. Both films drew overwhelmingly female audiences, too. In a distant second, "Life of the Party" earned an estimated $18.5 million, which is a few million short of some of McCarthy's other comedy collaborations with husband Ben Falcone like "Tammy" and "The Boss." It also got similarly mixed reviews from critics. The Warner Bros. release stars McCarthy as a woman who decides to go back to college with her daughter. The studio is "thrilled" with the results. "It's escapist movie palace fare," said Jeff Goldstein, Warner Bros.' president of domestic distribution. The modestly budgeted "Breaking In" took third place with $16.5 million, over-performing most industry expectations despite lackluster reviews. The film stars Union as a mom who has to fight to save her kids from a group of home invaders. "It's an edge-of-the-seat thriller that you may not always associate with Mother's Day, but it worked extraordinarily well," said Jim Orr, Universal's president of domestic theatrical distribution. The Universal Pictures release is just the latest in a long string of successful collaborations with producer Will Packer, who also produced "Girl's Trip" and the "Ride Along" films. "We have a great partner in Will Packer and 'Breaking In' is another example of his very talented approach and our mutual success," Orr said. Also benefiting from the Mother's Day timing was "Overboard," which earned $10.1 million to take fourth place, down only 31 percent from its debut last weekend. And rounding out the top five was "A Quiet Place" with $6.4 million. The John Krasinski-directed thriller has now earned $169.6 million domestically. John Krasinski on hating horror movies, why he made "A Quiet Place"
"This is a typical Mother's Day weekend with a big blockbuster in the mix and some counter programming thrown in for good measure as we await the arrival of 'Deadpool 2' next week," said comScore senior media analyst Paul Dergarabedian. Because of the massive success of "Infinity War," the box office is up 4.9 percent for the year, and a slew of blockbusters coming up are hoping to continue the success, including "Deadpool 2" and "Solo: A Star Wars Story" just one week later. 1. "Avengers: Infinity War," $61.8 million ($281.3 million international). 2. "Life of the Party," $18.5 million ($2.9 million international). 3. "Breaking In," $16.5 million ($1 million international). 4. "Overboard," $10.1 million ($8.2 million international). 5. "A Quiet Place," $6.4 million ($2.8 million international). 6. "I Feel Pretty," $3.7 million ($3.5 million international). 7. "Rampage," $3.4 million ($6.4 million international). 9. "Black Panther," $1.9 million. 10. "Blockers," $1.1 million ($1.2 million international). 1. "Avengers: Infinity War," $281.3 million. 3. "Truth or Dare," $7.4 million. 5. "Sherlock Gnomes," $5.6 million. 6. "Us And Them (dir. Liu)," $4.2 million. 7. "I Feel Pretty," $3.5 million. 9. "I Am Your Mom," $3.2 million. 10. "Life of the Party," $2.9 million.